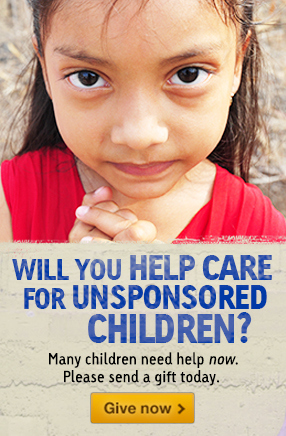 Yesterday was Compassion Sunday at my church and I am so excited to tell you that 9 children received new sponsors! I still have few children left and I would like to offer you the opportunity to sponsor a child too. 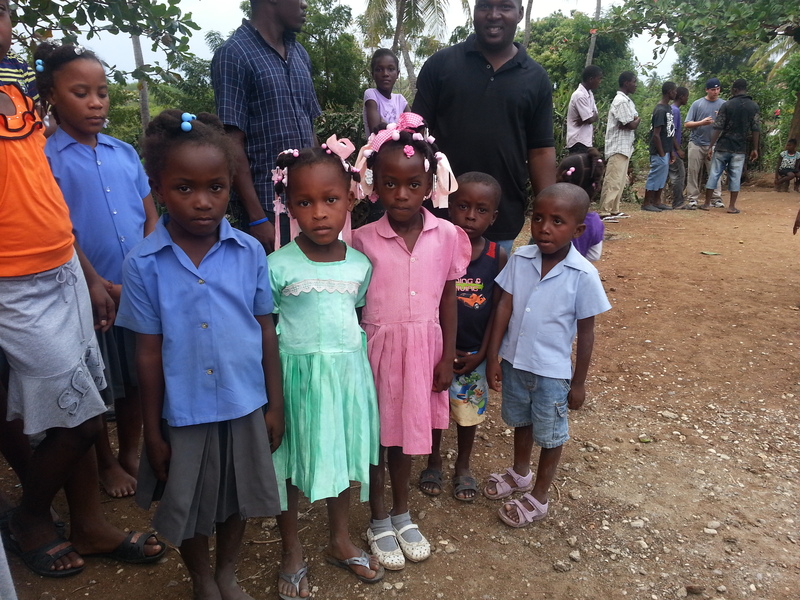 Here are a few of the children who still need sponsors. This first little guy is Melquicidec Masi from Bolivia, South America. Melquicidec is 7 years old. He lives with his father & his mother and 3 brothers & sisters. he enjoys reading and attending church activities. 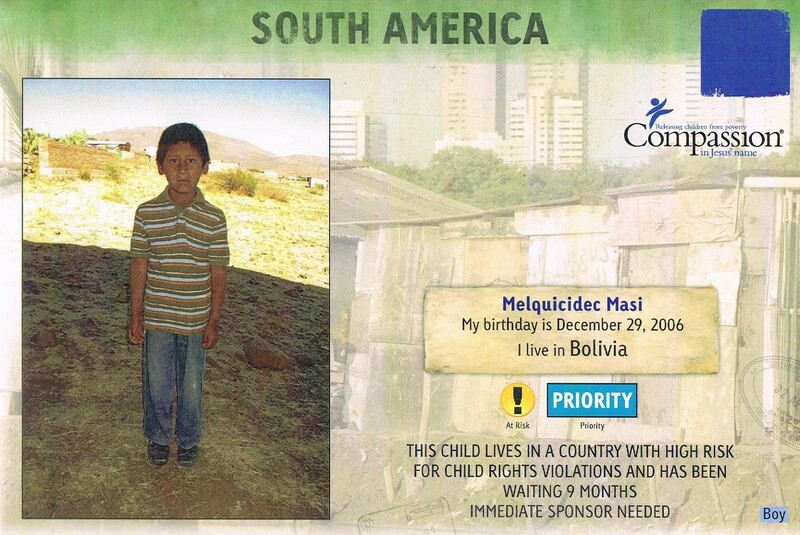 Melquicidec is a priority child because he has been waiting over 9 months for a sponsor. Melquicidec lives in a country where there is a high risk of child rights violations. 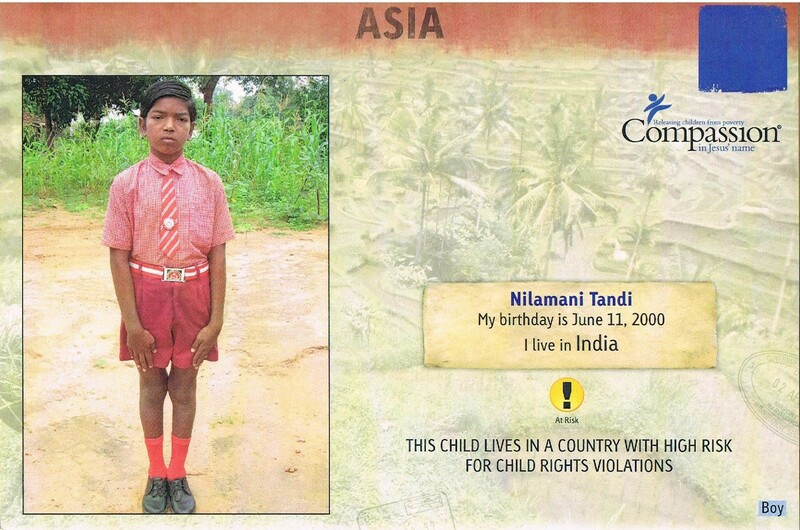 This next child is an older child, his name is Nalamani Tandi he will be 14 years old on June 11th. Nalamani is from India. He lives with his father, his mother and 4 brothers & sisters. Nilamani helps his family by buying or selling in the market and caring for his brothers and sisters and caring for animals. Nalamani enjoys listening to music, running and playing group games. 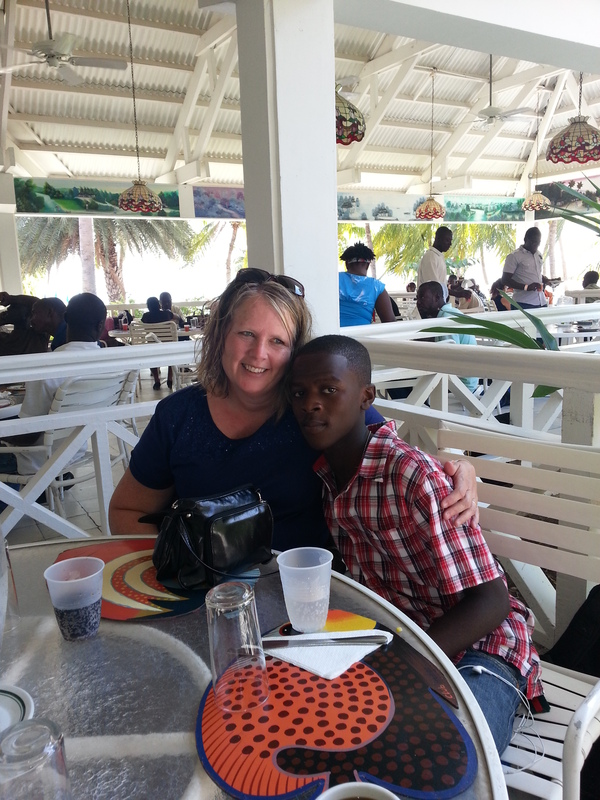 He attends church activities, Bible class and Vacation Bible School. Older children are sometimes harder to find sponsors for. 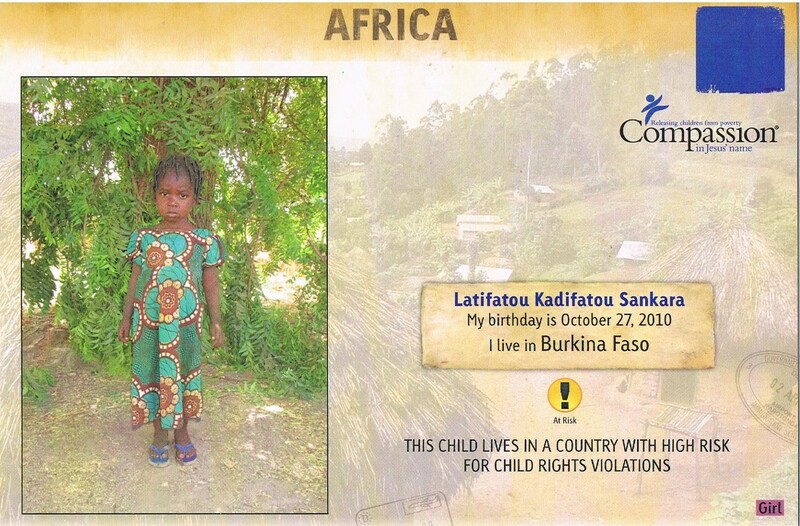 Next is this sweet little girl her name is Latifatou Kadifatou Sankara. Latifatou is from Burkina Faso, Africa. She lives in a country where there is a high risk of child rights violations. In her home Latifatou helps by running errands. She lives with her father and her mother and there are 5 children in her family. Latifatou does not attends school at this time and she enjoys playing group games and attends Bible class. 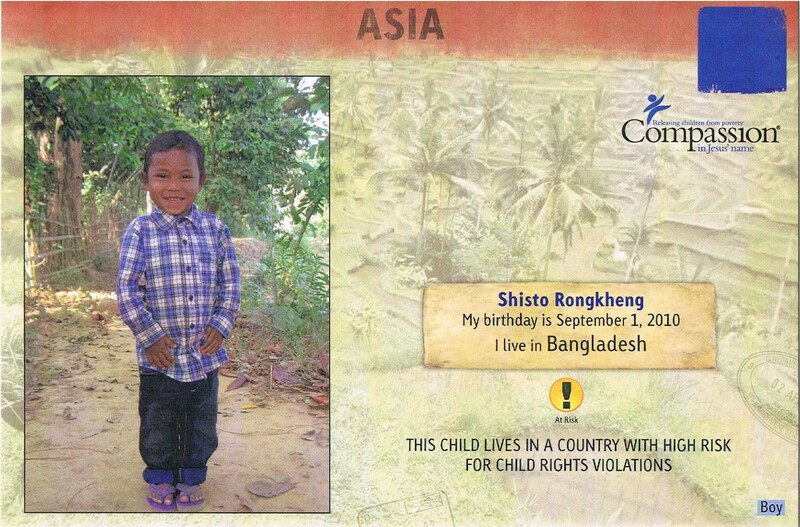 The last child I am posting today is little Shisto Rongkheng from Bangladesh, Asia. He is 3 years old and he also lives in a country with a high risk of child rights violations. Shisto lives with his father and his mother and there are 3 children in his home. He does not attend school yet and he enjoys playing soccer and playing with toy cars. He attends church activities regularly. Your love and support will help these children to receive the assistance they need to grow and develop physically, mentally and spiritually. Please pray for these precious children and also please consider sponsoring one of them today. You can email me at tluvs2trvl@gmail.com and I can help you get your sponsorship started today. Thank you so much for reading and also for your prayers for these precious children. Thank you T for your faithfulness to share about these needy Children, may you be greatly blessed in your Ministry reaching out in compassion through Compassion International. Thank you for your kind words, I just love those kids so much and wish they all had sponsors. thank you for all you do too Anne and God bless you.